Sheraton Seagaia Resort is a large resort complex in Miyazaki, Japan. The name Seagaia is a combination of the words "sea" and "gaia", which is Greek for earth. 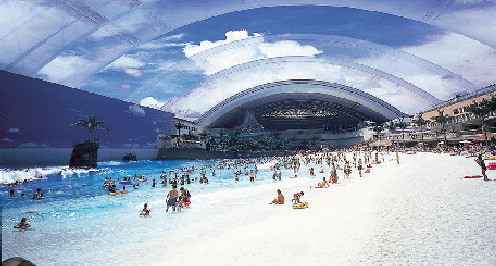 Ocean Dome at Miyazaki, Kyushu is listed in the Guinness Book of World Records as the world's largest indoor water park, measuring 300-m (984 ft 3 in) long, 100-m (328 ft 1 in) wide, and 38-m (124 ft 8 in) high, with a 140-m-long (459 ft 3in) beach made from crushed marble. And the temperature is 30 degrees Celsius year-round.